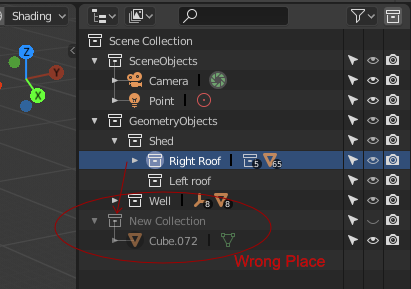 In the outliner when we right-click and select "new", a collection is added inside the highlighted collection (if one was selected before hand). So far so good. This doesn't happen when a user selects objects on screen and presses M to create a new collection that way. In that scenario, the new collection is all the way outside all hierarchies at the top level; which is not consistent or expected. Personally I would not consider this a bug. But getting @William Reynish (billreynish) and @Dalai Felinto (dfelinto) onboard: maybe they have something smart under their sleeves? With multiple outliners open Blender still knows (it seems) which collection entry was last clicked; the text gets brighter white in all collection windows. I think the user intention should somehow be honored. Some scenes can have deep hierarchies and this behavior makes things very tedious. 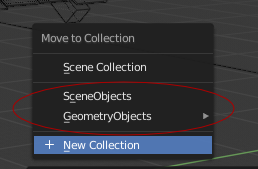 Maybe the Move to Collection operator could gather all possible parent collections and offer these as a dropdown in the operator options (defaulting to Scene Collection as it is now)? As a product designer my inclination is to always read the trail of clues the user leaves on the interface and follow the locus of attention. In this case I feel Blender has enough clues to decipher intent. if the user wanted a specific preexisting collection they would have chosen it through the "M" key popup dialog. a) If no outliners are open the user either doesn't care where the collection is added, or they are fine with the collection being at the top level (current behavior). b) if an outliner is open and some collection is highlighted the intention is to do something at that location in the hierarchy. The user is working and clicking there for a reason. Dalai Felinto (dfelinto) claimed this task. When calling from the viewport it ignores all the outliners and simply shows the entire collection tree to the user. ... then it forgets how to do that through the "M" interface. I feel we should take UI inconsistencies seriously enough to the level of "bug", otherwise they add up over the years. As far as the user is concerned creating a new collection is just another thing to be placed in the outliner hierarchy. Ideologically it is exactly the same principle as adding a new object to the scene; that too is another "thing" placed in the outliner hierarchy. In both instances it should be possible to preselect a location in the outliner ... 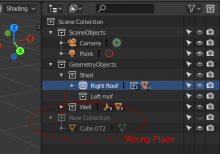 So if it works as expected for adding objects it is only reasonable to assume that by pressing "New Collection" something will be placed in a preselected spot in the outliner panel. For the last time, (at the moment), what you do in the viewport has nothing to do with the outliner. They are each their own contexts. You can create "New Collection" when using "M" even inside a sub-collection (e.g., inside GeometryObjects in your case). Try it with a more dense populated collection tree and see if it makes more sense. Basically "things" in the outliner should always show inside, or next to, what is already selected in the outliner. It is how every list-box control works, every OS interface. Can you imagine trying to create a new folder on Linux or Windows and your new folder ends up always in the root directoy no matter where you initiated the command ? The outliner is merely a filing system to organize the staff on the viewport. The topic at hand here is consistency. Try this yourself --> select some collection deep in a hierarchy and then press Shift-A to add a cube on your viewport. Do you see a "think" being added in the outliner inside the collection you had selected ? Same thing should happen to collections. They are just folders. @Thomas Androxman (ThomasAn) sorry but you are getting the Move to Collection operator wrongly. That said I exhausted my arguments here and will no longer repeat myself. Simply put, the user wants to create a new directory for a bunch of objects and stick that directory in a predetermined spot on the filing system.